This week’s Quarterly lesson focuses primarily on New Testament scriptures where our Savior, Jesus Christ, councils all those who would become followers of his. 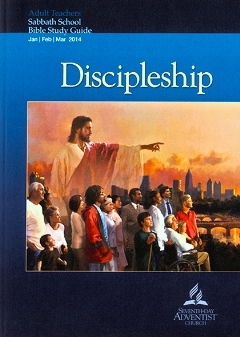 Since it is the duty of all Christians to proclaim the Good News of the Gospel of Jesus Christ, this certainly is appropriate instruction for all those who would consider themselves to be a disciple of Jesus Christ. While the Quarterly lesson does an excellent job of presenting the very words of our Savior the instructions found in First and Second Timothy are scriptures which focus on discipleship and have been largely ignored throughout this quarter. Paul’s letters to Timothy serve as specific admonishments for all who would actively proclaim the Gospel message of our Savior and encourage the spiritual growth of fellow believers in the true Body of Christ. The outline of First Timothy presented here serves to illustrate the value of studying Scripture sequentially contextually in the way it was originally written. In doing this we will indirectly confront the lesson statements that promote unique Adventist doctrines or the extra-biblical quotes from the writings of Ellen G. White. Perhaps more for our benefit than Timothy’s, Paul identifies himself as having apostolic authority. Admonition is given to avoid myths and false doctrines not founded upon ‘stewardship from God that is by faith’. COMMENT: Our only sure way to avoid ‘myths and false doctrines’ is to build our faith on Scripture alone, be indwelt and led by the Holy Spirit and study all Scripture in context. The resolve is to have love, a pure heart, a good conscience and a sincere faith. There are those who attempt to teach the law but do so without understanding. The law is good if used lawfully knowing that is not for the just but for the disobedient. Give thanks to Jesus Christ who is the one who gave Paul strength and appointed him for service even though he was formerly an enemy of God. Jesus came into the world to save sinners of which Paul was foremost. COMMENT: Among several other things, this means that Jesus Christ’s mission is not and never was to vindicate the character of God. God does not need to justify himself before those he has created. Consider God’s challenge to Job, Job chapters 38-42. Jesus saved Paul, the foremost of sinners, to show his mercy towards all those who believe in him for eternal life. COMMENT: What Paul is saying is that, because of what Jesus did for him, all those who come to Jesus in believing faith can know they have eternal life. How dare Ellen White say different! All honor and glory forever and ever belongs to God alone. Timothy is compelled to ‘wage the good warfare’ in accordance to the prophecies made about him by holding to ‘faith and a good conscience’. Those who have shipwrecked their faith have been handed over to Satan that they may learn not to blaspheme. Paul urges that ‘supplications, prayers, intercessions and thanksgiving’ be made for all people including those who rule over us that we may lead peaceful and godly lives. It is our God’s desire that all people be saved. There is one God and one mediator between God and men, the man Christ Jesus who gave his life for all. Paul reminds us that he was appointed a preacher and an apostle to the Gentiles in faith and truth. All men should pray, lifting holy hands without anger or quarreling. Likewise, women should adorn themselves with modesty and self-control. Let women learn quietly without exercising authority over men because it was Eve, not Adam, who was deceived. In-other-words, women are to learn with a spirit of quietness. COMMENT: Theologians have pondered Paul’s statement ‘she will be saved through childbearing’ for centuries without coming to an agreeable interpretation. As a possible understanding of what Paul was referring to consider what God said in Gen. 3:14-19. What is clear through the study of related scripture is that personal salvation and the forgiveness of our sins is only and totally through the shed blood of our Savior at Calvary therefore Paul appears to be referring to something different. The qualifications of an overseer (elder or bishop) must be someone above reproach, etc. Manage his own home well otherwise how can he manage God’s church. Must not be a recent convert. He must be well thought of by outsiders so that he cannot become a snare of the devil. Deacons must meet similar qualifications to that of an overseer. Specificatlly they are to be dignified, not double-tongued, addicted to much wine and not greedy for dishonest gain. COMMENT: The study of both the root Hebrew and Greek words used in the Bible which are translated into English as the word ‘wine’, including the grammatical context, makes it clear here and elsewhere in the Bible that this is an alcoholic beverage Paul is referring to. The only thing condemned throughout Scripture is the drinking of too much wine. Don’t be a drunkard. Deacons who serve well gain not only a good personal standing but they bring confidence in the faith centered on Christ Jesus. Paul expresses his desire to be there with Timothy. These instructions are all about how one should behave in the household of God and is ‘a pillar and buttress of the truth’ which is ‘the mystery of godliness’. He was manifested in the flesh (John 1:14; 1 Peter 1:20). He was vindicated by the Spirit (John 16:1-15). He was seen by angels (Luke 2:13; 24:4). He was proclaimed among the nations (Gal. 2:2). He was believed on in the world (2 Thess. 1:10). He was taken up in glory (Acts 1:2). They will become devoted to deceitful spirits and teachings of demons through the hypocrisy of liars whose consciences are seared. They will forbid marriage or abstinence from foods, not understanding that God created everything good. Nothing is to be rejected if received with thanksgiving. COMMENT: Even though maintaining good health is important and a right thing to do what you eat is not part of the gospel message of Jesus Christ. To do so and call it ‘the right hand of the gospel’ is one of those things Paul identifies as a ‘teaching of demons’. A good servant of Christ Jesus will teach these things to the brothers. They are words of faith and good doctrine. Have nothing to do with irreverent silly myths, rather train for godliness. While bodily training is of some value godliness is of value in every way, both now and the life to come. This is what all Christians should toil and strive for. These are the doctrines that must be taught. Be an example in speech, conduct, love, faith and purity. Focus on Scripture, exhortation and teaching. Do not neglect the gift the Holy Spirit has given you. Keep a watch on yourself for in this both you and your hearers will be saved. Do not rebuke. Instead, encourage….. COMMENT: The implication here is that needed correction is to be appropriate, tactful and most likely not normally done in public. Of course, Paul has very different instructions concerning those who teach heresy, especially where the gospel of Jesus Christ is altered, or there are those who are unrepentant in sins that affect the whole Body of Christ, Gal. 1:8-9; 1 Cor. 3:1-9; 1 Cor. 5:1-11. Honor a widow who is truly a widow. She has her hope set on God. Qualifications given for enrolling a widow. Refuse to enroll young widows. They need to remarry. Believing family should provide support for a widow instead of the church. While highlighting the unique situation of widows, a Christian’s should care for all who are needy, 1 John 3:16-18. COMMENT: In today’s society the government has taken over the responsibility for the care of those in need in the form of public ‘welfare’. However, when the ‘system’ fails it is still important for the church to fulfill these biblical mandates of looking after the truly needy, working within or without governmental support. Elders who rule well should be considered worthy of ‘double honor’ because ‘The laborer deserves his wages’. Never admit a charge against an elder without two or three witnesses. Let an elder who persists in sin be rebuked in the presence of all. Do not prejudge, judge with partiality, be hasty in the laying on of hands and keep yourself pure by not taking on the sins of others. For while the sins of some are conspicuous the sins of others appear later. Parenthetic advice to Timothy: Use a little wine for the sake of your stomach and frequent ailments. Good works are conspicuous, even those that are hidden and appear later. Bondservants are to regard their masters as worthy of all honor so that the name of God and the ‘teaching’ may not be reviled. Bondservants with believing masters must not be disrespectful on grounds that they are brothers. Anyone who does not agree with this is conceited and understands nothing. Such a person has an unhealthy craving for controversy and quarrels about words. The words of our Lord Jesus Christ and the ‘teaching’ accords with godliness. COMMENT: The Bible and Christianity in particular neither condemn nor accept slavery. Historians tell us that at the time Paul wrote this there were sixty million slaves in the Roman Empire which means this was a major issue in the First Century Church when both slaves and their masters became believers within the same local church. However, history also tells us that largely because of the spread of Christianity slavery has, in most cases, peacefully disappeared from both the Roman Empire and the rest of the modern world. A tragic exception to this is the American Civil War. The natural question is; does this passage of Scripture have any relevance for the age we live in? The answer is yes because in truth the dynamics of the present day employer-employee workplace dynamics is the same, making our root Christian attitudes and responsibilities universal principles that haven’t changed. Godliness with contentment is great gain for we brought nothing into this world and we take nothing out. Those who desire to be rich fall into temptation. The love of money is a root of all kinds of evils and where some have wondered away from the faith. Pursue righteousness, godliness, faith, love, steadfastness and gentleness. Take hold of eternal life to which you were called. Charged in the presence of God….and our Lord Jesus Christ: to keep the commandment unstained until the appearing of our Lord. COMMENT: The Great Commission, Matt. 28:11-20, is the one command all who are disciples of the Lord are personally commanded by our Savior to keep until his reappearing at the end of this age. Charge the rich not to be haughty and to set their hopes only on God. The rich are to do good and always be ready to share. Guard what you have been entrusted with and avoid irreverent babble and false knowledge. Some, having professed so, have swerved from the faith. To be a Christian disciple means that Jesus Christ is your Savior and Lord. Jesus did not come to prove we could do the same as him by him living here among sinners. Jesus is and always has been holy without sin since eternity. Jesus could not sin because he does not have a sin nature. Consequently, he did for us what we can never do for ourselves. That is, he came to die and pay the penalty of death for our sins, overthrow death and come back from the grave guaranteeing our own resurrection when we place our faith in his salvation and lordship. It is by his gift of the Holy Spirit that he changes us. As Christians, our spiritual growth (sanctification) is totally and only through the indwelling Holy Spirit. Even that is not a work of our own. The purpose of presenting this outline and encouraging the inductive verse-by-verse study of First Timothy has been to show that the topic of discipleship, or any other biblical topic, can best be learned and understood by taking one section or book of the Bible and study through it the way it was originally written instead of jumping all around Scripture patch-working potentially unrelated verses together. When including biblical references at least make sure you have maintained the context the supporting passage was found in. Also understand that it is the role of the Holy Spirit to lead each and every person into an understanding of God word, John 16:5-11. Therefore accepting the gospel message of Jesus Christ and receiving his gift of the Holy Spirit would be the very first step in truly understanding the will of God and the meaning of Scripture in your life. Copyright 2013 BibleStudiesForAdventists.com. All rights reserved. Revised December 30, 2013. This website is published by Life Assurance Ministries, Camp Verde, Arizona, USA, the publisher of Proclamation! Magazine. Contact email: BibleStudiesForAdventists@gmail.com.